Moto Guzzi California 1400 launched! 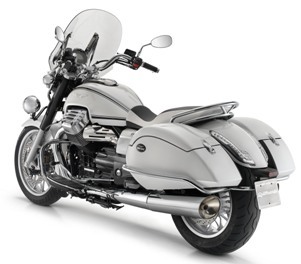 On November 13, 2012, Moto Guzzi history was made with the launch of the new California 1400 at EICMA show in Milan. Two versions are being made available and both are built in the famous Mandello del Lario factory in Italy. The two models launched are the California 1400 Touring and the Custom. The California Touring is a bagger that comes with the following features: stylized hard bags (35 liter capacity each), windshield, touring handlebars, touring saddle, chrome tube guards up front for the engine and at the rear for protecting the hard bags, three selectable engine performance modes, traction control, cruise control, and anti theft. These features are all standard equipment on the Touring. I have to say, my California Vintage now seems 20 years old when I compare it to the new 1400 Touring. More about that further down the page, but first let’s move on to the new 1400 Custom. 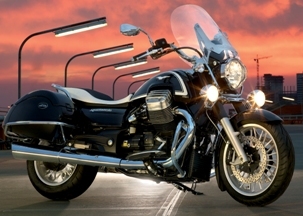 The California 1400 Custom is what Moto Guzzi describes as the “wicked sister” to the Touring model. With drag bars, a lower seat, no windshield and no bags, the Custom seems to take on the role of a technology-driven street cruiser with three selectable performance modes, traction control and cruise control standard on this bike same as on the Touring model Since the Custom has no side bags, the advanced rear shocks get to show off their external reservoirs that provide for improved suspension performance and a custom racing appearance. Unlike the recent past, a huge range of well thought out factory accessories are offered by Moto Guzzi for the new California to help owners customize their new beast. 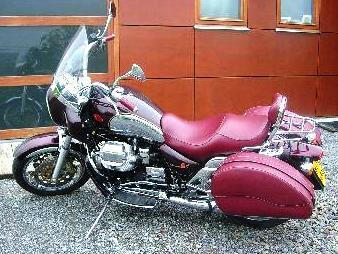 Those add-ons include such things as slip-on exhaust pipes; black chrome handle bars; additional LED lights and LED turn signals; a lower windshield; leather-covered side bags; various brackets and covers; billet aluminum levers, grips and mirrors. Other more practical accessories include a choice of two different trunks of 50 or 60 liter storage capacities, heated grips, and passenger foot boards. Personally, I’m blown away by this major step forward from Moto Guzzi. They have not only join the ranks of modern full size touring and cruiser motorcycles, but they have establish new standards by offering advanced technology as standard features on this class of motorcycle, and by manufacturing the largest v-twin production motorcycle engine in Europe. Congratulations to all at Moto Guzzi and thanks to Piaggio for supporting this project! 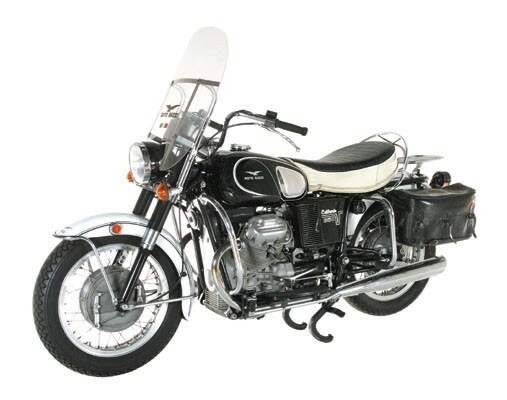 The Moto Guzzi California 850 Eldorado was introduced to America at a time when Harley-Davidson quality and performance was just about at an all-time low. The relative success of the Eldorado was in part due to the quality and workmanship of the motorcycle, and the heavy-duty durability it had. The durability was proven by several law enforcement agencies use in the US back in the early to mid 1970’s. Moto Guzzi EV 80 seat, panniers, grip covers and the ignition key cover for the 80th anniversary Moto Guzzi California EV 2002 model were done in a very bold red leather from Poltrona Frau, which certainly was not ordinary biker leather! I have a 2007 California Vintage and can tell you that there is nothing quite like riding a Guzzi. It is my second Guzzi the first being an 850 Eldorado that I bought new in 1973 and had a blast riding through the Rocky Mountains. It was made to ride in mountainous roads with all the curves, climbing and descending. They are a reliable cycle that many people don’t know about and don’t get the credit they deserve. Like I said in my earlier posting “There’s no substitute for cubic inches”, or in this case cubic centimeters… More torque is always a good thing, and as this bike has grown in weight, I hope the torque is sufficient. There are definitely occasions that I’ve wished for more power while riding my Titanium up a long grade against the wind (especially if I had to put in low-grade ethanol blend somewhere). I hope this bike will run better on lower quality fuels, because I’m afraid that’s all that will be available to us in the future. It sounds like the Guzzi engineers improved the factory suspension components so let’s hope the 1400 handles like the California we’ve all come expect. Cheers to the factory boys! Andare Veloce!! 1400 cc looks like an improvement, but the torque to weight ratio of the California 1400 is not too different from the the, say, old California Vinatge that I own. The only REAL difference: The new one delivers it’s max torque at much lower rpm…. The new one looks great though – but how will it sound? Will it have the same swagger as the oldie?